offers a great choice for acccommodations while visiting the Yukon. We also have a selection of vacation rental suites with one, two, three or four bedrooms suitable for small or large groups. Each bedroom has an ensuite bathroom for extra privacy and convenience and a kitchen, dining area and livingroom. You’ll enjoy our luxury Bed & Breakfast and Vacation Rentals during your stay in Whitehorse, the vibrant capital of Canada’s Yukon Territory. This four star B&B/Vacation Rentals is centrally located downtown, close to bus service shopping and walking distance to the Yukon River along with many attractions. We are only two blocks from the scenic clay cliffs, which offer wonderful hiking and walking trails. Our spacious rooms at the Bed and Breakfast are bright, clean and comfortable. Each of our rooms have a private bathroom, hairdryer, telephone, TV, high-speed Internet access and a work desk. One of the highlights of our facility is the deluxe lounge area for guests – it includes a full kitchen, laundry, high-speed Internet access and big-screen TV. Private bathroom, phone, and T.V. Courtesy Airport Pickup or Drop Off with Victory Taxi for a flat rate of $15 (guests only). Several Golden Host Awards from the Tourism Industry Association of the Yukon for excellence in customer service, most recently in 2014. 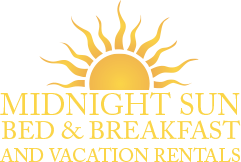 Read more about the Midnight Sun Bed & Breakfast / Inn on both the Testimonials page and the Awards & Media page. Received 16 awards in 16 years from different organizations including: Golden Host Awards, Tripadvisor, Whitehorse Chamber of Commerce, Arrington’s Bed & Breakfast Journal.